Thank you for checking us out. We have put some useful information together for new clients all in one location. Ask us about our Referral Program if you were referred to us by a friend or neighbor! 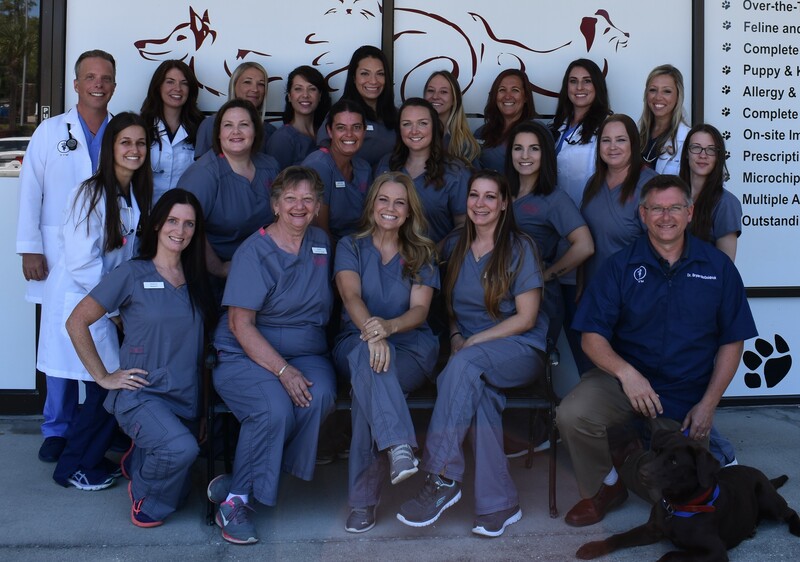 The Vet Clinic of Palm Harbor would like to take this opportunity to welcome you, your family and your furry family members to our website. As you continue to browse and explore our website, it is our hope that you will learn more about our dedication to your family and the quality veterinary care and service that we provide. With Compassionate medical and surgical care, we stress the importance of preventive care, client education, and the human-animal bond in a well-managed value based veterinary clinic that strives every day to be our best for you and your pet. "Everyone at VCPH has taken excellent care of my lil’ man since he was a puppy. Caring staff, always helpful and patient.. even living 30+ miles away now, I won’t take him anywhere else!" Dr. Hathaway received her B.S., M.S. and Doctorate of Veterinary Medicine degrees at the University of Florida. Although she enjoyed her time in Gainesville, she loves being back home in Pinellas County. She has been a member of the VCPH family since 2014. When not spending time with her VCPH family, clients and patients, she enjoys participating in organized veterinary medicine as a member of American Medical Veterinary Association, Florida Veterinary Medical Association and Pinellas County Veterinary Medical Association. Her hobbies include enjoying many outdoor activities like kayaking, biking, exploring local parks/trails and catching live music at her favorite local spots. Dr. Hathaway also really enjoys crafting, working on house reno projects and spending time with her family and friends. She and her husband Donnie share their home with their cats Brie, Barron and Freddie. Dr. Turk is an “Army brat” who grew up in several countries and a dozen states. After high school he served in the Army himself, then graduated with a B.A. in Economics, Philosophy, and Religious Studies. He was the director of a college textbook store but decided to quit his job and return to college after watching a team of doctors treat his very ill Border collie at the veterinary hospital at North Carolina State University. Six years later he received his Doctor of Veterinary Medicine degree from the same institution. When he’s not taking care of his patients, Dr. Turk enjoys sailing and boating in the Florida sun, live music, learning to be a foodie, and traveling. He is a member of the American Veterinary Medical Association, Florida Veterinary Medical Association, and Pinellas County Veterinary Medical Association. Dr. Turk lives in Palm Harbor, usually with one or more rescued Border collies. Dr. Bollenback is a local girl who grew up in the Tarpon Springs area. She received her B.S. in Biology from the University of Central Florida and went on to earn her Doctorate of Veterinary Medicine from the University of Florida. Dr. Bollenback graduated UF with a certificate in Veterinary Business Management and is a Fear Free certified practitioner so she understands the value limiting your pet’s stress while at the vet. She is a member of the American Veterinary Medical Association and the Florida Veterinary Medical Association. In her spare time she enjoys everything outdoors including SCUBA diving and spear fishing, taking her jeep to the beach, and riding her horse, “Lance”. She and her husband Jeb share their home with three rescue pups, “Loki”, “Quincy”, and “Mark”. Dr. Rosenblatt grew up in South Florida before moving to Gainesville where she earned her Bachelor of Science and Doctorate of Veterinary Medicine degrees at the University of Florida. After eight years in Gainesville, Dr. Rosenblatt is excited to move to the West Coast of Florida and see all that it has to offer. She is a Fear Free certified professional and is a member of the American Veterinary Medical Association, Florida Veterinary Medical Association, and Pinellas County Veterinary Medical Association. Her special interests include Dermatology and Feline Medicine and her hobbies include running, watching game shows, kayaking, and many other outdoor activities. She shares her home with a brown tabby named “Thor” who she has had since he was eight weeks old and is looking forward to rescuing more pets when the time is right. Kris is a Certified Veterinary Technician with a special interest in surgery and intensive care. She has worked at the University of Illinois Teaching Hospital ICU and University of Wisconsin Veterinary Teaching Hospital Surgical Center. Besides being a CVT, her main duties include over-seeing hospital operations and keeping everything running smoothly. Kris and her family share their house with their Chocolate Labrador 'Sam' and three cats 'Alex' “Pumpkin” and 'Oliver”. Traci joined the Vet Clinic of Palm Harbor in October, 2005. A native to Florida, she is a lover of the outdoors, she enjoys boating and spending time with friends and family (2 and 4 legs). Her love for animals has brought her to the clinic. Traci's spare time is spent between Tarpon Springs and Chiefland. She currently shares her home with her special cat 'Twinkle'. Traci continues to learn and grow here at the Vet Clinic and is now one of our managers. Vanessa was born and raised in Belgium before continuing her education in the U.S. She speaks fluent French, English and some Dutch. She has an AA degree in Sciences and furthered her studies at USF in the pre-vet program. She has volunteered countless hours at Humane Societies. She has certifications in dentistry, pet nutrition and cold laser therapy. She has been a veterinary technician at VCPH since 2005 and is now our veterinary experience manager. She strives to bring happiness to our clinic’s pets, pet parents and to our team every day. She definitely has a soft spot for senior animals and focuses on their comfort. She has two children (Logan and Savanna) and currently five animal companions (a Chihuahua, 2 cats, an albino rabbit and a love bird) She enjoys the beach, dancing, traveling and horseback riding.